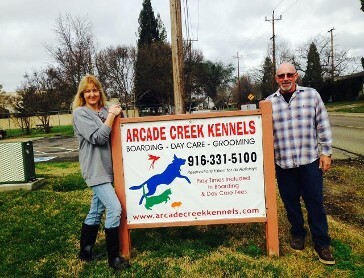 Arcade Creek Kennels in Sacramento, California, is more than a dog daycare—we offer pet boarding to all kinds of animals. We are conveniently located on two acres, with one acre for pets to play. Your pet does not have to be spayed or neutered to use our facility. There are large and small dog runs offered for long- and short-term stays. We recommend contacting us seven days in advance to book a kennel, especially around the holidays, as boarding kennels can fill up fast. However, same-day services are permitted. We require rabies, DHLP, Bordetella, and K9 Influenza Virus Vaccination (H3N2 and H3N8 strains) shots. You only need to bring food and any medication your dog or cat needs, as we provide bedding, bowls, and water buckets to make it as easy and convenient as possible. All drop-offs must be no later than 4:00 pm. All pickups must be done by 5:30 pm. Playtime is offered three to four times daily with other dogs, and always under the supervision of our pet care professionals. If your dog is not social, it will be accompanied on an individual basis by a staff member. Playtime ranges from 20 minutes to an hour. Feeding depends on the pet's individual schedule, and we strive to keep them on their schedules for food and medications. We offer playtime and feeding for just $20 a day, medications $1 additional (ask about multi-pet discounts). Appointments are required for all daycare services, whether weekly or daily. You can also pre-pay for daycare. All you have to provide is a leash when bringing pets in (otherwise we are an off-leash facility). Ask about our after-hours training classes as well. As a pet owner, you want the best possible treatment for your dog, cat, or other animal while you’re out of town or otherwise preoccupied. Our animal care professionals appreciate this, and we do everything we can to maintain the most caring and comfortable facility for pet boarding in Sacramento, CA. We offer flexible scheduling and personalized care for the animals staying at our two-acre center. Boarding your dog or cat understandably may cause you some hesitation. You can rest assured, though, that our highly trained staff of animal-loving assistants will give your pet the attention it deserves. Trust us to provide your dog, cat, or other pet with our daycare services for peace of mind while you’re away from home. Contact our staff for more information about our pet grooming or boarding. We proudly provide service to pet owners from all over Sacramento, CA.